Published on February 6, 2009 in Business Growth, Case Study, Do Stuff, Internet Strategies and Lead Generation. 1 Comment Tags: Eskae Jeweler, Eskae Jeweller, Exponential Marketing, Marc Dussault. 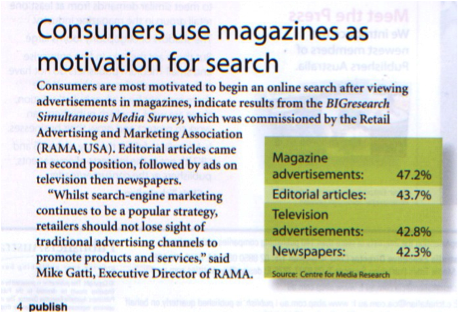 Published on September 5, 2008 in Branding, Do Stuff and Internet Strategies. 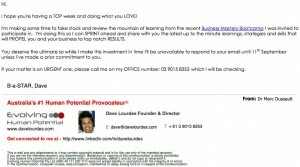 1 Comment Tags: business, Dave Lourdes, David Lourdes, exponential, Growth, Improvement, Marc Dussault, Profits. Today’s post is about a 1% improvement that is quick and easy and FREE. It can pay HUGE dividends over and over again. It’s actually TWO strategies in one. 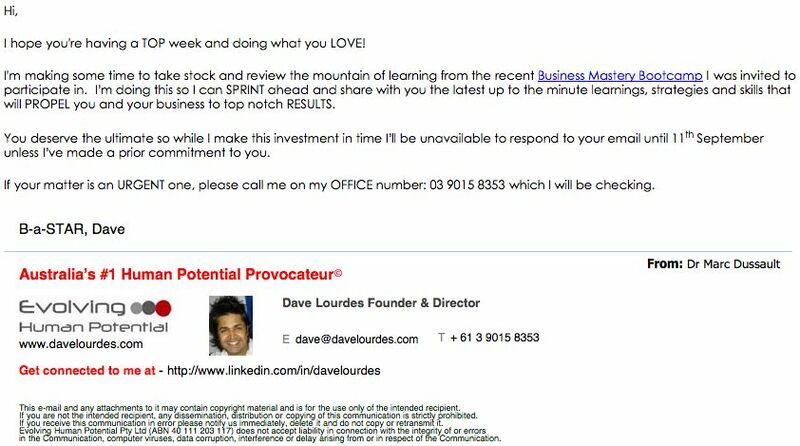 First it’s about having an autoresponse system that when you are away from the office at an event or on leave, you have your e-mails autoresponded – but not just with a standard “I’m out of the office” message, but with something more valuable for your clients… Like David Lourdes has done below. The second strategy is hyperlinking to my event – the Bootcamp. That means some people will click on it and go to my site. That costs nothing for David and nothing for me. It’s totally exponential. Can you see how EASY it is to make a 1% improvement that makes a difference? It’s so easy, yet so few people do it! 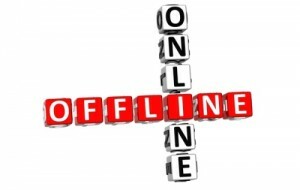 I am signing off with Dr Marc Dussault – not to be formal, but to improve my SEO rankings. I will be discussing that on the Internet Mastery Blog. The other point I wanted to make is that when you start to make 1% improvements, they all add up. You know that from watching my 1% Improvement YouTube video. The point is STOP trying to make the BIG changes and improvements. Stick to the 1%. They all add up to way more than the BIG STUFF YOU NEVER END UP DOING ANYWAY! I mean that in a good way, I really do! Published on July 29, 2008 in Business Growth, Events and Internet Strategies. 0 Comments Tags: Bootcamp, business, exponential, Growth, Internet, Marc Dussault, Profit. I know you’re into the Exponential Mindset™ because you’re reading this! I also know you want to make more money with less effort. Next week, in Sydney, Melbourne and Brisbane, I will be holding the 3rd and LAST series of the Exponential Wealth Creation Workshops. They are priceless if you’re keen to stop working so damn hard. All the information is available on the landing page by clicking here. Register now – last week’s events were filled to over-capacity – we had people sitting in the hallway! If you’re keen to attend the 2008 Exponential Internet & Business Building Bootcamp book your place NOW. The GOOD NEWS: we’ve secured the venue and it’s a FANTASTIC ROOM with bright windows… The PERFECT environment… The BAD NEWS: Seating is limited and we’re going to run out of seats. We’re getting the final details today and counting down the available seats as of tomorrow. With the previews next week, we expect to SELL OUT the event, which means first in, best dressed! Call Leela or Gulliver now on 1800 626 204 right now to make sure you don’t miss out. Published on July 20, 2008 in Business Growth, Events, Fun and Internet Strategies. 0 Comments Tags: exponential, Growth, Internet, Internet Marketing, Marc Dussault, Marketing, Profits, Wealth Creation. I also know that GETTING a response is one of the KEY success strategies of communicating on the Internet (and otherwise!). You are always better off to POLARISE an audience than you are to DULL them to sleep. How many synonyms do you think there are for DULL? that You Can Take to the Bank – Guaranteed ! Bonus 2: Australia’s #1 Exponential Growth Strategist, Dr Marc Dussault shares his little-known strategies to get MAXIMUM results! “Exponential Wealth Creation”? What the heck do we mean by that? Let’s break it down… first a straightforward, mathematical definition of ‘exponential’. In other words, it doesn’t just increase – it accelerates… continually. OK – now apply that concept to ‘Wealth Creation’ (we all understand that idea already, don’t we?) that means your wealth accelerates constantly – now can you start to see why “Exponential Wealth Creation” is pretty darn exciting? Yeah… I thought so… who wouldn’t want a piece of that action? With pleasure. By the way – What do we ask in return? Just 3 hours of your valuable time – and when you come along you’ll see just how valuable 3 hours can be. What you learn on this page alone could produce a rich vein of new income possibilities for you to mine just a short time from now. And at the Preview you’ll get a concentrated overview of the vast range of wealth creation strategies covered at the upcoming Exponential Internet & Business Building Bootcamp 2008. Hear the most lucrative principles, techniques and tips of the world’s #1 marketing growth strategist. Tony ‘splits’ Jay’s brain open and exposes a plan that took Jay thirty years to conceive, draw, revise, test, prove, master and document… and now you can harness and profit from today. Master the ‘Jay-mindset’ to make your own money-making connections, starting right now. What you MUST do to get MAXIMUM results! TWO simple questions to keep you focused and on track. The SUCCESS FACTOR that separates the winners from the losers, you’re either one OR the other – NO middle ground! This breakthrough autopsy report, based on extensive survey of Australian SME business owners, will strip your business naked right in front of your eyes in less than 29 minutes. The good thing is, you’re the only one watching! This report is vital reading for any SME owner who wants to avoid the chronic diseases that are destroying too many Australian small businesses. This revealing survey – one of the largest of its kind in Australia – reveals what Australian business owners are and aren’t doing to generate sales leads and sales online. In over 11 pages of detailed results and analysis, you’ll discover what the top 5% of SMEs are doing to generate cash, customers and profits online and also learn from the costly Internet marketing blunders that the vast majority of internet marketers are making without even realising it. The results of this survey will surprise and shock you – ignore their clear message at your peril. This 14-page report dissects more than 100 ways you can uncover hidden assets in your existing business and turn them into cash within weeks, days, even HOURS. It explains step-by-step what has to happen for you to start getting paid what you deserve BY YOUR BUSINESS rather than have just a job with tax benefits! This report exposes what the successful entrepreneurs have kept secret for so long. Now it’s your chance to get into the ‘mindset’ of a champion and uncover how you can replicate the same results for yourself, in your business. This report is ONLY available to attendees of this PREVIEW EVENT. This report, hot of the press, summarised how the top 10% Internet Marketers make more money than the other 90% combined. The Internet is well known as the easiest thing that’s hard to do – UNLESS you KNOW what the successful Internet Marketers know. Get your hands on this report and transform your website into the 24-hour-a-day money-making machine that pays you even while you sleep. The principles the ultra rich and super successful have kept to themselves for years are yours for the taking when you get access to this exclusive report. The Exponential Internet & Business Building Bootcamp is an intense 3-day “Immersion” experience, famous the world over for producing marketing breakthroughs that expand your mindset, fatten your wallet and leave your competitors in the dust! This FREE Preview is a CAN’T MISS event if you have a real interest in separating yourself from those who only ever dream of wealth… and joining those who seek the proven, fast-track action plans to fulfilling those dreams in ABUNDANCE! If you have any questions in the meantime please call our team here at Empowernet International on 1800 626 204 – they’ll be happy to help. With the economy, stock and real estate markets in their current downturn cycle, it is more important than ever for you to protect your wealth and get an unfair advantage on your competitors. The Exponential Internet and Business Building Bootcamp will reveal little known secrets the ultra wealthy use to protect their assets and income when time gets tough. You can’t afford not to know what will be revealed during this 3-day event. Invest 3 hours for a ‘test drive’ at the FREE PREVIEW. The bonuses alone will make the 3-hour invest worth your while. Click here to register now before it’s too late. Published on July 12, 2008 in Business Growth, Events, Exponential Mindset, Fun and Internet Strategies. 0 Comments Tags: Anthony Robbins, Bootcamp, business, exponential, Growth, Internet, Marc Dussault, Marketing, Personal Development, Profits, Sydney, Tony Robbins, UPW. I suggest you get yourself a cup of coffee or tea and get comfortable. Today’s post is going to be a classic. If you’ve been an Exponential Marketing Enthusiast™ on my database for some time, then you’ve seen the 10, 12, 16 or even 20 page e-mails I’ve sent. Now that I am blogging, I thought I would do that here instead. There are several reasons to do this, which I’ll explain right after I take care of WHY I am writing to you today. You know by now that this year is the LAST UPW event that Tony Robbins will hold in Australia. I posted Michael Burnett’s video yesterday and we’ve made it official by announcing it to the ASX. I won’t repeat what’s already been said or written – You can watch the video below or read the Press Release that explains Press Empowernet Heads into Asia. What I do want to tell you is that BECAUSE this is the LAST AUSTRALIAN Unleash The Power Within (UPW) Firewalk Experience EVER, I want to make it EXTRA SPECIAL. You get 2 Tickets for 2 Events for 2 People for $2,997. That’s over $17,000 of value. You get 2 Tickets to the 3-day Exponential Internet & Business Building Bootcamp in Sydney Monday 18 August to Wednesday 20 August 2008 Valued at $5,997 each PLUS get 2 GOLD Tickets to Anthony Robbins’ 4-day Unleash The Power Within (UPW) Firewalk Experience Seminar Friday 19 September to Monday 22 September 2008 Valued at $1,295 each. That’s more than $17,000 in value for $2,997. I’m calling it the DOUBLE, DOUBLE WHAMMY BUNDLE. Bring a friend or spouse and make Tony’s last LIVE UPW life-changing event a memory of a lifetime. Exponential Marketing Strategies and Tony’s Peak Performance Neuro-Associative Conditioning Strategies go hand-in-hand. UPW has been staged in Australia MORE OFTEN than any country other than America and Sydney has held UPW more times than any other city in the WORLD. This is the LAST chance to see Tony live at UPW in Australia. This is why we’ve combined the 3rd Annual Exponential Internet & Business Building Bootcamp with Unleash The Power Within (UPW) for the DOUBLE, DOUBLE WHAMMY – to make it irresistible for you to attend for what will be TWO unique and UNFORGETTABLE events that will transform your business and personal life. But you have to act now. There are ONLY 300 seats available at the Bootcamp. With the DOUBLE DOUBLE WHAMMY BUNDLE, that means there are ONLY 150 bundles available. There are already close to 2,000 people booked to attend UPW 2008, many who will now want to ‘upgrade’ to attend the Bootcamp at this incredible price. You do the maths. If you already purchased your UPW Ticket – call us on 1800 626 204 for your $997/person upgrade ticket to the 2008 Bootcamp NOW. I am staging PREVIEWS in each of Sydney, Melbourne and Brisbane NEXT WEEK. You can attend or call us on 1800 626 204 to book your DOUBLE DOUBLE WHAMMY BUNDLE right now while they’re available. In case you don’t already know, way before I joined Empowernet and became its Executive Chairman, I personally attended UPW 5 times. Yes – 5 times, every second year over 10 years. Each time, I took the opportunity to step up to the next level. What I call living a life by design rather than evolving by default. Did it work for me? You be the judge – I retired, financially independent in 2005 at age 42. Over 24 years, Monica and I have travelled to 36 countries and I have not had a sick day in the past 20 years. So I admit it, I’m biased. So biased in fact that I don’t want you to miss out on the LAST chance to see Tony AND learn the EXACT SAME Exponential Marketing Strategies that have made him a household name around the world and gave me financial independence 3 years ago. I’m so biased that I’ve coordinated this offer with The Tony Robbins team to make it an ‘absolute no-brainer’ that you simply can’t refuse. If you’ve been saying to yourself “I’ll go next year” – THERE IS NO NEXT YEAR. There is no second chance. TONY is not coming back to Sydney to do UPW again – ever. But let me get back to my bias, because it’s important for you to know where I’m coming from. If you don’t know my personal story, SPEED READ my personal profile in 2 minutes. Yes that’s right – SPEED READ it right here, right now. Let me get back to my story and why it’s important TO YOU, RIGHT NOW to attend the 2008 Bootcamp and UPW in Sydney THIS YEAR. As the founder of my own start-up company, I used Exponential Marketing strategies, with no money down, to build one of my service companies 3 times faster, with double the industry average sales per employee, with a fraction of the industry’s employee attrition rate while consistently producing twice the profitability of his competitors. But what you may not know is HOW I achieved that feat. The ONLY reason I was able to get THOSE kinds of results was because every single long-term employee I had was a firewalker. I didn’t wait for Tony to come to Canada – I sent my staff wherever Tony was – Belgium, Washington D.C., Hawaii, California. My staff paid for the trip and I paid for the seminar – a 50/50 investment in THEIR future. I need to repeat this. I was committed to achieving outstanding results and the FIRST THING I did was build a team around me that LEARNED these KEY SUCCESS STRATEGIES. I have to say it again – I sent every single one of my staff – more than 10 people in total over several years to UPW events. It was not a ‘bonus’, but a REQUIREMENT – NOT an option. What I don’t get is why you wouldn’t SCALE with additional help/assistance to help you achieve your goals?!?! Why not INVEST in that person who can liberate you once and for all from the shackles of the entrepreneurial jail? Trying to do this on YOUR OWN is tantamount to failure. I NEVER did it on my own. I was the ARCHITECT, the MASTERMIND Craftsman, but NEVER said I did it all – in fact it’s the reason I have not had a sick day in the last 20 years, Monica and I have traveled to 36 countries, I still fit into the SAME SIZE SUIT I wore more than 20 years ago in my 20’s, I play squash EVERY DAY I am in Sydney and oh yeah – I accumulated 5 university degrees in my spare time. It’s really quite simple really. If you do what I did. Tony calls it “modeling the masters” and “success leaves clues”. I’ve always said that Tony Robbins made me the best I can be. Brian Tracy turned me into the best sales person and manager I can be. Jay Abraham helped me become the best marketing person I can be and his strategies led to my financial independence at age 42 – 18 years ahead of my childhood dream. But y’know what? My bias doesn’t stop there. I also invited friends and family to attend UPW and Tony’s other LIVE events – BECAUSE I wanted a social support group that would HELP, SUPPORT and ENCOURAGE me to become a better person and achieve MY GOALS. Dr Napoleon Hill calls it having a MasterMind Group. I should know something about it since I wrote the book on MasterMind Groups! One friend was working for a government agency making $60,000/year which was pretty good at the time. Within 12 months he was making over $100,000 and within 3 years, $200,000+. That’s 4 times more. But that’s not the entire story. His arthritic hip problems subsided AND he invested his additional new income to become financially independent within the next 10 years, buying a brand new sports car and moving into a house TWICE the size. Another friend tripled his income from $50,000 to $150,000 in one year which on its own is impressive, but more importantly he ended up buying the business he worked in as a contractor and in the last 6 years, EVERY SINGLE competitor except one has gone bust, bankrupt, out of business or shut down. He never would have survived were it not for Tony’s Peak Performance strategies and Exponential Marketing strategies. A third friend was a student, single, struggling, making $8,000/year as a part-time temp employee, taking 1 course/semester (Getting Cs and Bs) and struggling to make the rent each month. Within a year, she tripled her income to $25,000, lost 10 Kgs, got into a serious relationship and TRIPLED the number of courses she took AND started to get As and Bs! Within the NEXT year, she was making $60,000+ completing her degree in half the time based on my book “Get The Best Grades With The Least Amount Of Effort“. Strategies that I perfected into a system that is now an eBook. Strategies based on Tony’s Peak Performance Neuro-Associative Conditioning Principles that WORK. I could tell you dozens of other stories, but I think you get the idea. The point I want to hammer home though is that I did that as a ‘private citizen’ NOT AS A PUBLIC SPEAKER. I did this to IMPROVE MY OWN RESULTS. My RESULTS speak for themselves and I don’t say that to boast, but to make it crystal clear that I have a 100% bias – this stuff changed my life. So much so that people thought I joined a cult – you’ve heard the cynics call it that. The cynics who are mortgaged to the hilt and are frustrated and worried that the petrol price has gone up 10 or 20 cents/litre. The naysayers who are still working as employees or WORSE are cash-strapped ‘entrepreneurs’ making LESS than they would as employees. They can think what they want – I don’t care. Well that’s not true. I wish they would ‘get it’ soon – there are less than 2 months, then it’s too late. Anthony Robbins will never have another UPW Firewalk event in Australia ever again… If they ‘wake up’ in 3 or 4 months – they’ll have to travel to attend a UPW event – travel overseas… If they don’t come to an Australian event, the chances are slim they’ll travel overseas. In 1993, I attend my first UPW in Montreal Canada. It was the FIRST, ONLY and LAST time Tony had a UPW in my home town. BECAUSE of the French language issues, I knew then I had to ‘step up’ and go. I knew Tony wouldn’t be back in Montreal any time soon. I waited a few years until 1996. (1) I couldn’t do it on my own as fast or as easily – why re-invent the wheel when others have “been there, done that” charting the QUICKEST, FASTEST and EASIEST path?!?!? So Monica and I signed up to Anthony Robbins’ Mastery University at WHOPPING COST of more than $40,000 including travel, foreign exchange, tuition and accommodation. Now my cynical friends AND FAMILY thought I had FINALLY gone over the edge. But I KNEW something NO ONE else knew. This was going to be one of the last Mastery University events that TONY would do from start to finish. I spent 6 days at Financial Mastery in Maui, Hawaii with Tony leading the best FINANCIAL EXPERTS in the world that mentored, guided and taught me what I need to create the $40,000 I had just invested in Mastery University within 3 months BEFORE Monica and I attended Life Mastery in Kona, Hawaii. Life Mastery in Kona Hawaii was 9 days of full-on 14 to 16 hours/day with Tony on Stage… A friggin’ marathon… NEVER EVER to be repeated. I treasure that ‘week’ Monica and I spent re-designing our lives. BECAUSE we now live our DREAM DESTINY. We live in Australia BECAUSE that’s what we decided at the last most meaningful event of the Mastery University curriculum – Date With Destiny in Palm Springs, California. Less than 10 years after Mastery University, I retired from the ‘rat race’, launched Jay Abraham Asia Pacific and became Executive Chairman of Empowernet International – the exclusive agent for Anthony Robbins in Asia Pacific. Wow. Even writing that to you today humbles me. This has been and continues to be an honour, privilege and responsibility that I take to heart every single day. Soon, the same will the case with UPW in Australia. This is it – YOU HAVE TO COME TO UPW in Sydney THIS September. 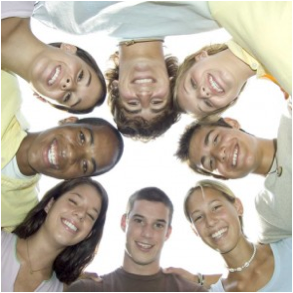 Click here to find out HOW you can declare this as a PERSONAL educational expense. Click here to find out HOW to salary sacrifice this so you don’t miss out on this LAST chance to attend UPW in Australia. Without getting into what our Internet and Business Mastery Platinum and Diamond Programs are specifically – the ONE thing you should know is that for these $49,995/year programs, we have ONE CONDITION to GUARANTEE the results of DOUBLE or TRIPLE RETURNS ON INVESTMENT. Every single Platinum and Diamond Member MUST attend UPW. We know that UNLESS they learn Tony’s Personal Peak Performance strategies, their personal blockages will PREVENT them from achieving extra-ordinary goals, outcomes and results. Let me say that differently – When you apply Exponential Marketing strategies, you’re #1 problem will be GROWING TOO QUICKLY and you MIGHT start to self-sabotage. Disempowering beliefs are THAT powerful. Tony covers this on day three of UPW. They are like having your foot on the accelerator AND the brake AT THE SAME TIME. That’s why the DOUBLE DOUBLE WHAMMY is a MUST and WHY I have made it IRRESISTIBLE. That’s why the price/combination has been set at the LOWEST, EASIEST entry point possible. 2 tickets, 2 people, 2 events, $2,997. I can’t believe how incredible value this is PLUS it’s the LAST TIME you get to see Tony LIVE at UPW in Sydney. So how does the 2008 Bootcamp figure into all this? In June 1996, I travelled from Montreal, Canada to Los Angeles, California for Jay Abraham’s Ex! Factor Bootcamp. The reason I invested the $5,000 tuition PLUS $5,000 in travel and accommodation costs for a 3-day weekend Bootcamp event was because I was nuts, psychotic and delusional – NOT! BUT many of my friends thought that. I mean c’mon $10,000 for a 3-day weekend Bootcamp?!?! That’s not a value judgment – it is what it is. They had the SAME choices I had back then. I decided to invest in myself and then didn’t. I was NOT smarter than they were. I was not more capable. I was not more hard working. I was not more well connected. I was not wealthier (then). That’s what you need – an open mind. Your mind has to be open – how else can you be reading a blog post this long? 11, 12 or maybe 13 people unsubscribed to the e-mail I sent directing people to this blog post. They can’t ‘get it’ because they were never open to the possibility – does that make sense (cents) to you? $10,000 for a 3-day weekend Bootcamp – THE BEST INVESTMENT I EVER MADE. As you know, I have 5 University degrees – one of them is an MBA. What you probably don’t know is that I would give up that MBA for the 3-day Bootcamp in a heartbeat. An MBA was valuable, but it thought me all the things that could go wrong as well as the theoretical complexities of business, management, strategy, sales, accounting and finance – NOT ONE MBA COURSE TAUGHT ME HOW TO SUCCEED OR MAKE MORE MONEY. The Bootcamp, was filled with 36 hours of MONEY-MAKING STRATEGIES that totally worked in synch with Tony Robbin’s Personal Peak Performance Mastery Strategies for the DOUBLE WHAMMY compounding effect, where 1+1 = 10. With an open mind, I want to take you into the 2008 Exponential Internet and Business Building Bootcamp. I know that’s a big word, but not as big as antimimeticisomorphism now THAT’S a mouthful! Exponential and antimimeticisomorphism means to do things that are out-of-the-ordinary to get extra-ordinary results. Out-of-the-ordinary means writing a 10, or even 20-page blog post like this one. It means COMBINING TWO EVENTS TOGETHER and SLASHING THE PRICE to a never-before-seen level. Click here to reserve your seat at the next preview in Sydney, Melbourne or Brisbane. If you have any doubts, don’t just put this aside – you won’t come back to it. No one ever does. There are TWO kinds of people – Moving Towards and Moving Aways From People. Start right now to make the change YOU KNOW you want to make and register for the preview RIGHT NOW. Don’t put it off and don’t just register and not show up – that doesn’t work either. In fact, you may not know this, but for FREE preview events, HALF the people who REGISTER don’t show up. It means that JUST BY SHOWING up – you end up BEING ABOVE AVERAGE. I mean c’mon let me be serious for a second and get STRAIGHT TO THE POINT. What else can you do at home watching TV or surfing the net that could be more valuable than learning strategies from a self-made millionaire who’s RIGHT WHERE YOU WANT TO BE. Who has taught HUNDREDS of people to replicate amazing RESULTS over and over again!?!? Click here NOW to reserve your seat at the next preview in Sydney, Melbourne or Brisbane. If you can’t physically make the previews and have already decided to attend the 2008 Bootcamp and UPW, please call us now to reserve your DOUBLE DOUBLE WHAMMY BUNDLE on 1800 626 204. If you have any doubts, then come to the 3-hour preview in your city. It’s the LAST CHANCE this kind of offer will be made. 2 tickets for 2 people to attend the Bootcamp for $2,997 is incredible. For TWO of you to also attend UPW is, well, irresistible. As you may know, I used a home study program to ‘prepare’ for my first Bootcamp and in the 12 to 14 weeks PRIOR to the Bootcamp, I tracked that I made over $50,000 in ADDITIONAL NEW SALES as a DIRECT RESULT of the strategies I learnt. I want you to have the SAME result which is why I have prepared a specially designed a Pre Program Preparation™ for you BEFORE the Bootcamp, in-between the Bootcamp and UPW and AFTER UPW to hand-hold you through the process step-by-step so you get the MAXIMUM RESULT from attending BOTH events. I know what’s required because I’ve been to UPW 5 times and attended 3 Bootcamps as well as staged 3 Bootcamps with the legendary Marketing Genius Jay Abraham. Things happen for a reason – you KNOW this year is it. There are no more excuses. All I need to do now is make sure you fully grasp the incredible value that the Bootcamp holds for you. To do that, I need you to download the PDF of the 2008 Bootcamp by clicking here. With that in hand, you’ll see there are few NEW components. First, the format has been expanded to be 3 FULL DAYS that last 12 HOURS/DAY. I will go on record and say that I AM NOT PLANNING ON EVER OFFERING a 12 HOUR/DAY 3-DAY BOOTCAMP FORMAT EVER AGAIN. When I attended UPW in Montreal in 1993, Tony had a classic saying “Just one more thing…” That just one more thing would take us to 2, 3 and even 4 AM in the morning… Yes 3 and even 4 in the morning. Of course you’d think we’d start later the next day… NO friggin’ way! Tony was full-on, non-stop, hold nothing back. The venues tolerated it for a few years and then stopped it – NOT because Tony didn’t want to keep going, but because the venue staff wanted to go home – you can’t really blame them. THAT full-on 16+ hours/day event was magical, life-changing and priceless. I want to make THIS edition, the 2008 Edition of the Bootcamp the SAME. With the extra time we’ve allocated with the venue’s full cooperation, we will go from 9 AM to 9 PM for three days straight. We are going to have Exponential MasterMind Workshops – not just discussions, but full-on MasterMind Workshops DURING the event so you can apply what you learnt BEFORE you got in the room and the distinctions you picked up DURING the Bootcamp. There I go again with another BIG word – Distinctions. Click here to read what distinctions are all about in DETAIL. In brief, they are what Tony calls the ’2mm’ that makes all the difference – the headline that converts 243% more people from tyre kickers into paying clients, the ONE thing that turns a loss into a profit. The ONE thought you can have that puts $6,000 in your bank account in 6 days or the $300 that turns into $17,000 of cash in 60 days. To make this year’s Bootcamp special and even more Exponential, I decided to add an Exponential HotSeat™. 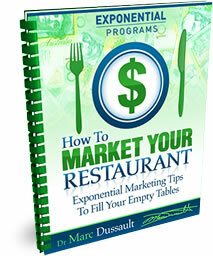 If you don’t know what a hot seat is click here to download “Exponential HotSeats™ Explained“. In short, I will take ONE person’s company, take it apart and re-build it using Exponential Marketing and Peak Performance Strategies – LIVE ON STAGE. I have never done this outside the $49,995 Internet and Business Mastery Platinum Program. A HotSeat is THAT powerful and will be one of the HIGHLIGHTS of the Bootcamp. A full-blown HotSeat has NEVER been done at an Australian Bootcamp. But that’s not all. In this 2008 Edition of the Exponential Internet & Business Building Bootcamp, we will also expand the Rapid Fire Q&A Sessions which means you and your fellow participants will go to the microphones and ask ANY QUESTION YOU HAVE on YOUR business and it will be SOLVED right then and there. This has been done in the past, but we’re going to do it 3 times/day to make sure you GET COUNTLESS distinctions, ideas and insights. When I attended my first two Bootcamps, I took 125 and 116 pages of notes. Don’t believe me? Click here to download the list of my Bootcamp Distinctions. 125 and 116 pages – is that insane or what?!?! Yes it is – INSANE PROFITS – to the tune of $2.5 MILLION DOLLARS of additional NEW INCOME that I translate to more than $100,000/year for me personally – a whopping $1,000,000 from a 3-day weekend. It STILL excites me to tell you – I just looked at the file and I have to admit EVERY TIME I read it, I get goose bumps. I want you to have the same goose bumps. That feeling of utter joy, happiness and contentment about an outstanding result. The PROCESS and JOURNEY is what makes it so special. I had fun walking on fire – all 10+ times I’ve done it. I lost my voice EVERY single time I attended UPW. I learnt exciting, fun and new stuff every time I attended a Marketing Bootcamp. I met incredible people from all around the country and the world – people who are STILL in my personal MasterMind Group. People who helped and CONTINUE to help me achieve incredible results EVEN TODAY. I know stuff most people will never know – NOT because I’m smart, but because I have strategies that WORK. I learnt from the best in the world. But this is not about me – it’s about what this means for YOU. I have a LOT of information, strategies and distinctions I want to share with you, at the 2008 Exponential Internet and Business Building Bootcamp. I want you to be there. I need you to be there. This year’s Bootcamp is going to be special – for all the reasons I’ve already told you. Something you might now have thought about is that the room will be filled with FIREWALKERS or FIREWALKERS to be… Can you imagine what that’s going to be like?!? Friggin’ amazing… There go the goose bumps again. So, before I sign off today’s post, I have one more set of reasons you MUST attend the 2008 Bootcamp. It’s been called the easiest thing that’s hard to do. It’s the MISSING LINK for most people who want to get the business going and growing online. Less than 10% of people/businesses make money on the Internet. 3 years ago, when I launched Jay Abraham Asia Pacific, all we had was ‘brochureware’ – now called a splash page. It was static and had at most 5, maybe 10 pages of text. We turned that into a $1,000,000+ revenue stream that now consists of more than 40 products, memberships and events specifically designed to help you get a quick start on the fast track to building your business online and offline. With more than 200 pages of content, it is one of the most extensive sites on the Internet for business building strategies in the world. All created in the last 12 months. We’ve increased our FREE organic traffic 10-fold, our sales have DOUBLED and our database size has QUADRUPLED. Without any increase in staff or human resources – EXPONENTIAL LEVERAGE ON STEROIDS. If Exponential Marketing Strategies are steroids for your business, Exponential INTERNET Marketing Strategies are PURE PROFIT ADRENALINE for your steroids! At the 2008 Bootcamp, I will explain how YOU can achieve similar and even better results. The 5 things you can do to your YouTube videos to create VIRAL TRAFFIC that TRIPLES the views AUTOMATICALLY and SYSTEMATICALLY. Then the 1 thing 99% of YouTube submitters don’t know that you MUST do to convert those VIEWS into SALES. The 2 things you MUST avoid at all costs to STOP flushing your hard earned money down the drain when advertising on the Internet -ESPECIALLY using Google Adwords. The COMPOUNDING effect of the 1 percent I keep talking about that produces a 3,778% result in 12 months – how the Internet is the easiest and fastest way to leverage this phenomenon. If you’re not sure what I’m talking about, watch my view my YouTube video that explains how a 1 percent improvement can turn your online sales channel into an auto-pilot cash cow. There are AT LEAST 10, maybe even 20 Exponential Internet Marketing Strategies I’ve used in this BLOG POST alone. All which YOU could be using to create the same level of success we have created and our Internet Mastery Platinum Program Members are using on a DAILY BASIS. This is the FIRST TIME EVER that BOTH Business and Internet EXPONENTIAL MARKETING strategies are COMBINED into ONE Bootcamp Event. Sure there are lots of sales-oriented events that take place – I am presenting at one the weekend of August 8th staged by Quantum Change -called the Success Secrets Summit, but those events are all about providing you with access to products and solutions. I’d love to see you there. I speak twice for a total of 2 hours – just like the other 10+ speakers. How much CONTENT can we cover in that time? You guessed it – NOT MUCH. The point of that event is DIFFERENT to the Bootcamp. It has its place – where else are you going to find and assess which products you want to buy to help you achieve the results you want? The Bootcamp is a FULL 36 HOURS of CONTENT with NO SALES PITCH. 3 full days of workshops, Rapid Fire Q&A Sessions and presentations on the BEST EXPONENTIAL MARKETING STRATEGIES for the Internet and Business all wrapped up into one event that will have your head spinning at the end of the day. Your head spinning with ideas that are disarmingly simple, easy and effective. You know several of them just from reading this BLOG and the Internet Mastery Blog. This is the ONLY event that combines BOTH Internet and Business Marketing WITHOUT the sales pitches. Even our most advanced Platinum and Diamond Programs don’t mix the two streams which is why we have TWO separate $49,995 programs, one for the Internet and one for bricks and mortar businesses. Our Internet Mastery Diamond Program is so exclusive that without a DIRECT LINK to it, you can’t find the page – that’s because we’ve limited access to the most committed of all the Exponential Marketing Enthusiasts. How can we possibly offer that FOR FREE? The Internet Mastery Diamond Program is the ULTIMATE exponential INTERNET case study. At the previews I will also explain how we are currently paying people $100/hour Flipping Websites For Profit. Are you making that kind of money on the Internet? Diamond Members “Buy” that income stream for “FREE”, but others are PAID $100/hour. How the #$@%#$ can that be?!?!? That’s the Exponential Mindset™ in action. This is what I am going to INTRODUCE to you at the PREVIEWS and TEACH you at the Bootcamp. How about if it was ‘FREE’?!? That’s why you MUST come to the 2008 Exponential Internet & Business Building Bootcamp. Click here to register for the PREVIEW now or call us on 1800 626 204. As you know by now, there is always a postscript. What Wikipedia doesn’t explain is the MARKETING VALUE a postcript has… We’ll cover that… You guessed it at the Bootcamp! I just wanted to explain one more reason WHY the 2008 Bootcamp event is special and not to be missed. You already know this is the LAST UPW that Tony Robbins will stage in Australia. You also already know that Tony has used the EXACT SAME Exponential Marketing Strategies covered in the Bootcamp to become a household name, one of the most recognisable people in the world as well as one of the top 50 most influential (according to Accenture). But how can I sit here and PROMISE you that you can achieve equally stellar results? I know that if I get you to focus on what you don’t know you know, I don’t have to teach you want you already know. Once you realise you now know it, then it becomes what you know you know and we just have to do that over and over again. Confused? Don’t be watch my video below “How to improve your results INSTANTLY” YouTube video now. There’s always a but. But I can’t do that unless I have time with you AND leverage Tony’s incredible UPW event. That’s right – I can’t do it on my own. There are 3 of us involved. Tony and I will be there, the question is will you? When would NOW be a good time to register or call us? Actually, there won’t be just the 3 of us, you’ll have more than 200 other like-minded Internet and Business Exponential Marketing Enthusiasts at the Bootcamp and more than 3,000 at UPW to create an atmosphere you will never forget. An atmosphere people will talk about for years. An experience that words will never be able to describe. A weekend you will cherish for a lifetime. As I cherish my 20 FULL DAYS of Mastery University with Tony in Hawaii and California. 20 Days – WOW. Don’t miss this once-in-a-lifetime event. Don’t have the regret – do whatever it take to be at the 2008 Bootcamp and 2008 UPW this year. There will NEVER be another set of events like this EVER. Thanks for listening and I look forward to seeing you in Sydney, Melbourne or Brisbane next week. Published on June 26, 2008 in Fun and Internet Strategies. 0 Comments Tags: funny stories, jokes, Marc Dussault, office, technology, wisecracks. The time has come for me to change my opt-in BONUS on my homepage. If you want to enjoy a funny story about office or technology issues, now’s the time to get the last laugh. If you want to receive one FREE funny story about office life and technology every week, go ahead and opt-in while it’s available and I’ll let you know when the new one replaces it. This is an Internet Mastery Strategy, but since it’s focused on office life and technology, I thought I would give you the chance to get it before it becomes an Internet product that you have to pay for. Published on June 8, 2008 in Internet Strategies. 0 Comments Tags: Annotations, Internet, Marc Dussault, Marketing, Strategies, You Tube, YouTube. This is so amazing, you have to check this out. I just published a post on my Internet Mastery Blog that you just must read. Click here now to see what the buzz is all about. I promise you – this is THE EXCEPTION that the benefits are WAY better than the HYPE! This is one of the most exciting developments I’ve seen in quite a long time. The Exponential possibilities are literally boundless! Published on May 25, 2008 in Do Stuff, Exponential Mindset and Internet Strategies. 0 Comments Tags: , 80-20, 80/20, analysis paralysis, cleaning chemicals, food hazards, food safety, gavin buckett, HACCP, kitchen, Marc Dussault, perfection, safe food, taking action. That’s when my Exponential Mindset™ kicked in. I have two things that are ingrained in my automatic business reflexes – an acute sense of urgency and the need to keep ‘doing stuff’. I told Gavin that he could go on to blogger.com, as we had taught him at a previous event and DO IT NOW. It takes LESS THAN 5 minutes to get a blog up – you can always fine tune it later. There was NO REASON to wait, in fact it was costing him money to wait. Yeah sure he can have a blog at his website address, but until then, WHY WAIT? He’s done a great job as you know from a previous post on our Internet Mastery Blog. The reason I am telling you this is so that YOU TOO can take action and DO STUFF. Don’t put off to tomorrow what you can do today. Gavin is still looking for a new business name – contact him if you have any inspiration at www.AGBSolutions.com.au. As you can see from the posts to this blog, this is NOT rocket science. It’s about making a 1% improvement EVERY DAY. Published on April 2, 2008 in Business Growth, Exponential Mindset, Exponential Sales and Internet Strategies. 0 Comments Tags: Marc-Ka-Ching Exponential Marketing Business Growth Sal. If you’re a Melbournian, can you clear your calendar this Sunday 6 April? The tickets for this event go for $495, but you can come as my guest. I am speaking from 10 AM to 12 PM. I will have some Marc-Ka-Ching Kubes with me in case you want to buy one. The last time I sold them at Empowernet’s Unlimited Power event, I gave away a bonus that generated more than $100,000 of value for the Kaleiscopic Kube Twisters!!! If you don’t know what a Marc-Ka-Ching Kube is, go to http://marcdussault.com/kube/ to check it out!